As Thailand is a popular tourist destination, the tourism industry has been growing every year. Hotels, large and small, in the country have embraced ICT technology to be part of their management efficiency, to help creating new business opportunities, to improve customer satisfaction and to maintain properties’ secure environments. UIH Smart Hotel Solutions are designed and engineered to help you manage your hotels proficiently. With UIH support, all of your hotel’s supporting system will flow faster at greater accuracy and efficiency. 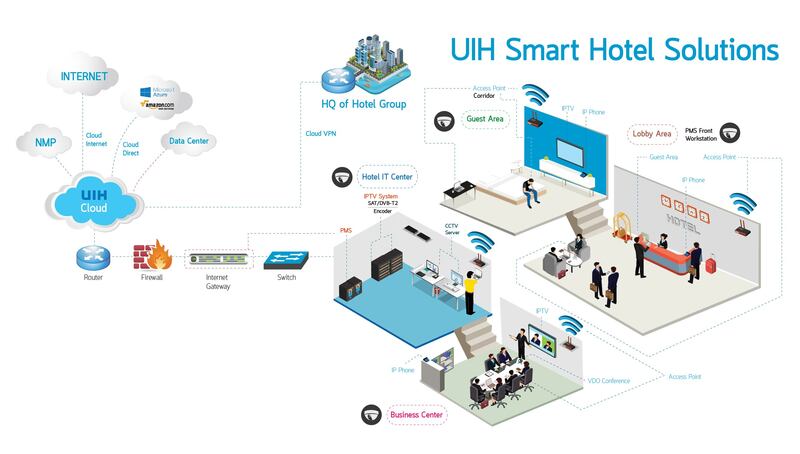 UIH Smart Hotel Solutions consist of various business essential solutions such as Wi-Fi, VDO Conference, CCTV, IPTV, IP-Phone, Cloud Computing and many more to come. All of those solutions can be mixed and they are all based on UIH’s famous high-speed internet or private connectivity. The Smart Hotel Solutions will provide, not only, convenient linkage between the hotel’s internal systems and external sources over highly secure and stable network, but also the hospitality linkage between your hotel’s services and your guests. With UIH’s Internet Management System, your hotel’s front and back office operations will enjoy the convenience of automation-driven Property Management System (PMS). Furthermore, our UIH Internet Management System will facilitate Wi-Fi services to your guests with ease by reducing any redundant processes. Internet users can, thus, surf Internet at faster speed. Coupled with data analysis capability, hotel’s marketing team will be able to analyze customers’ Internet behavior in order to build up market campaigns. UIH’s authentication system will only allow authorized persons to access hotel’s internet services. Our Smart Hotel Solutions store traffic-data logs which complies to Thailand’s Computer Crimes Act (No. 2) BE. 2560 (AD. 2017). The solutions also come with network protection and reports, which will help you assessing risks and make well-informed decisions. Your guests will enjoy smooth, convenient, satisfactory Internet services 24 hours a day through UIH’s secure and stable network, certified by world class institutes.